They don’t rent out towels, costumes or handkerchiefs anymore like they used to when these pools first opened in 1922. I love everything about this place, from the grand Ocean Baths entrance in art deco style, through to the viewing ramp, which looks out over the main 50m pool and the enormous leisure pool next to it. I hadn’t had a decent workout in a 50m pool for a week or two, so spent all my time doing joyous laps in that section rather testing out the bigger area, which had a pontoon in the middle for kids to jump off and was probably shallower than the main swimming area (but I’d need someone who knows to confirm that or not). There was just one elderly gent ploughing ponderously up and down Lane 1 when I got in the water, even though it seemed to me to be a peak hour for swimming: 11am on a Saturday morning. But by the time I’d done my laps, there was a rush to take over Lane 2 where I’d been swimming, so people were coming through constantly. With no lane markings on the pool floor, but thin string lane markers dividing each lane, I found my wayward stroke had me tangled up a few times in the rope, and my old bursitis came back a bit by the end of the swim. Still, this is a fabulous place. Right by the beautiful beaches of Newcastle just to the north, but raised comfortably above any incoming surf, at least on a calm day like I had, this was as calm a swim as you’d get in a 50m Olympic Pool in a leisure centre, only with the added bonus of fairly sizeable fish darting about underneath you at the deep end. With lane numbers just painted straight onto stone, and a light layer of sand over the floor, with the original façade still in place, it’s easy to imagine the place hasn’t changed so much since it was first opened (though of course there’s no diving board anymore). Of course there are now no trains all the way to Newcastle (whose crazy idea was that?? ).But you can get buses to the old train station, from which it’s probably a 15 minute walk to the Baths. There is a ramp into the water in the main 50m pool, but it was quite slippery so I held onto the rail, to avoid making a spectacle of myself to the sunbathers up on the viewing area above. Changing rooms – with warm showers – alongside the bigger swimming area to the south. But I preferred to wash the salt off on the showers in the open air by the 50m pool. 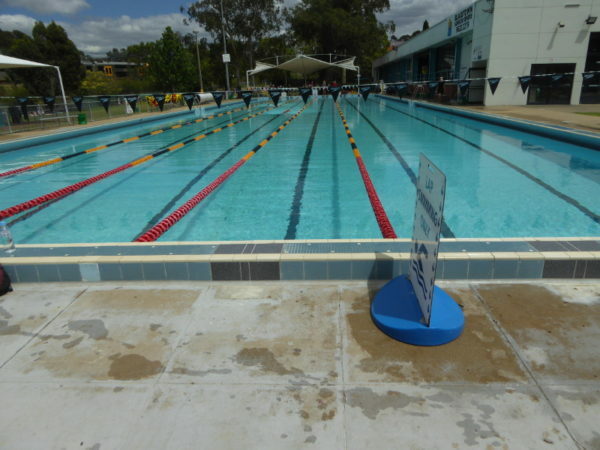 50m pool with lanes roped off plus a general swimming area, with a pontoon in the middle. Then a paddling pool just to the south again, though this may well be the canoeing pool officially, with the odd family using it to cool off with the kids in very shallow water on a hot day. I’m told also that when they clear the sand off the floor of that paddling pool, there is a mosaic map of the world – how fantastic is that? Not aware of tide making much difference here (correct me if I’m wrong), but judging by how much storm damage there appears to have been over the years, I imagine the waves do roll in on a strong swell (see a couple of the links below where others have witnessed storm surges over the pool walls). 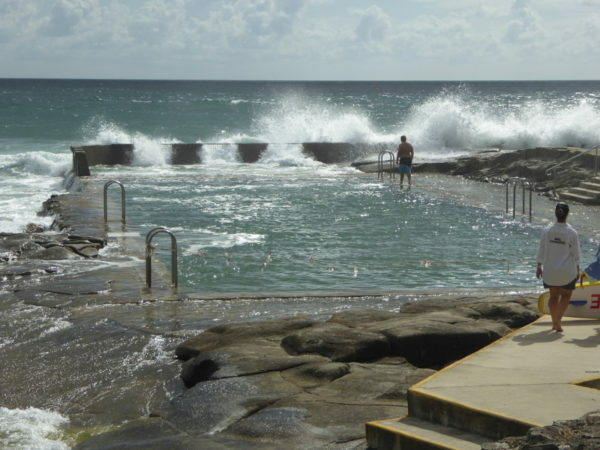 Thanks to the now defunct nswoceanbaths site for info on the history of Newcastle Ocean Baths. The Baths here were in use before World War 1, though they were only officially opened in 1922 (see the memorial stone laid by the then Mayor of Newcastle in the façade of the building). There was a penny or tuppence entry fee in those days, though you were offered towels, costumes and handkerchiefs (not sure what the latter would have been for, mind). But from 1953, the Baths in Newcastle have been free entry. The pool has survived various storms, a rocket fired from a Japanese sub in WW2 and even Newcastle’s earthquake in 1989. It remains a fantastic asset to the Newcastle community. Joy and Kent, the sporty version of Australia’s grey nomads. They had cycled in from their home 15kms away and come for a dip about as long as mine (so probably a 20 length swim). They normally swim in the bigger Merewether Pool just down the coast, but wanted to link into their bike ride this time, and they said as summer goes on they may switch to Newcastle because it has less of a problem with sea lice…Older than me these guys may be, but undoubtedly fitter too, as they do extreme things like cycle from Paris to Bruges or Amsterdam to Berlin. I think I’ll stick to the pool, personally. Great photo in the Newcastle Herald shows the waves behind the baths during the April 2015 storms. Nice piece on ABC Newcastle site about the Ocean Baths annual clean up. The NSW Ocean Baths blogger came here in 2010. Swimming blogger Sally was here in 2007. It was just over ten minutes’ walk to what was potentially the best coffee shop in Newcastle. But they moved to Lambton so Sprocket Roasters are no longer anywhere near the Ocean Baths in Newcastle. Tips for a good coffee near the Baths, anyone? Thanks for the comment, Yasmine. We liked Newcastle and its fantastic Ocean Baths so much, we even began to look at property prices round there…One day, maybe. Wow, North Queensland, huh? I haven’t been up there since my backpacking days but my memories then are of avoiding the ocean because of all the jellyfish in the water. Do they have any rock pools up there? I hope you checked out the Bogey Hole while you were in Newcastle Simon. Not far from Newcastle beach and just down from King Edward Park. Carved out by convicts in around 1820. Quite unique. Yes, I can’t wait to give it a go, Paul. I did go and check it out one weekend but there was a real storm that day and it looked terrifying down there. Will go back on a calm, sunny day. But somebody else told me it’s been temporarily closed to the public because of safety fears. Is that correct? I’m an ocean baths devotee from Newcastle but have been living the last three years in Canberra (some great swimming spots there too which surprised me!). I’m up in Newy now over holiday season and very much missing the Bogey Hole but soaking up Newcastle and Merewether baths- great community assets. Thanks for commenting and confirming the bad news on the Bogey Hole. You’ll have to let me know your favourite spots in Canberra, though I doubt I’ll expand my search for good outdoor pools to there for at least 18 months, with so many still to do in NSW. Enjoy Newcastle and Merewether this holiday. That’s a fantastic story. Is it true that Einstein and Curie came to the Baths? Or just that they filmed at the baths? March 2018 straight after a dip in the Bogey Hole; revisiting my teenage melodramas, I came here. Art Deco grand entrance is so cool, I am glad it is being preserved. I pretended to swim laps, and checked out main pool. Depth around the platform it is about waist height which is a great confidence booster for those learning to swim. Great social space, with a lot of different ages all spread out in languid sun worshipping posses. Coming from Wollongong, I was surprised at the condition of the change rooms, and hope that the NCC refurbishment goes well. Are your teenage melodramas recountable, Leah? Yeah I moved to Newcastle 6 months ago and live near the Newcastle bath. Swim there often if the beach is closed or too rough. Love the facility, (well done Council) especially the heated showers when swimming in winter. They are a life saver in July!